It was chilly early in the morning when we got into a tuktuk at the Agra train station headed for Taj Mahal. Thank god for the shawl that is most likely always nearby when we (ladies) are in India. 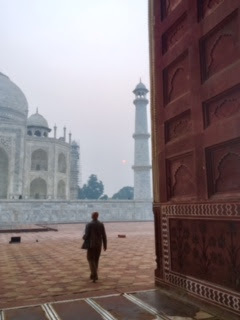 to put me into a festive mood, there were bird songs and the Muslim prayer call; India was waking up. Short line for tickets; admission 1000 rupees per person. If we had spent some more money on a guide, we would have been inside for the sunrise; please see photo below of the spectacularly red sun. The Taj (built in the 17th century with materials brought in from Makrana, Rajasthan (perhaps even the same type we encountered at the ashram), the jasper from Punjab, jade and crystal from China. 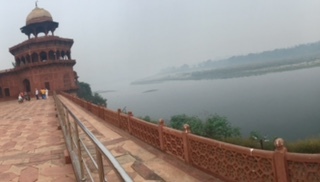 The turquoise was from Tibet and the Lapis lazuli from Afghanistan, while the sapphire came from Sri Lanka and the carnelian from Arabia) is situated at a river, called Yamuna (see photo below). By the way, did you know that the Ganges and Yamuna Rivers were just recently granted same legal rights as human beings? One always has to remove shoes when entering homes, temples and I loved walking around barefoot feeling the cold floor. So refreshing and grounding. To Follow: Indian Part 8: From Agra to Jodhpur or was it Jaipur?